An ambitious project is underway, backed by an initial allocation of 50 million euros, to restore and clean up what used to be one of the "happiest" bits of Campania Felix (Happy Campania), now fallen on very unhappy times. In question is the area known as the Regi Lagni; that is, much of the Campanian plain, the area to the north and northeast of Naples. The area forms a large drainage basin of about 1000 km2 (425 miles2); the Regi Lagni is the vast network of artificial canals that collect rain and spring waters in the provinces of Caserta, Naples and Benevento, an area that contains about 100 towns and a current population of almost three million. 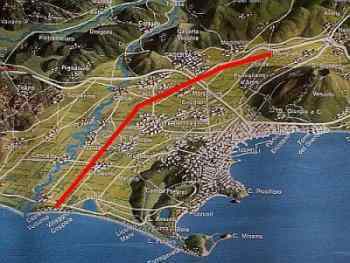 The main canal is 55 km (34 miles) long (the red line in the adjacent image) and arcs from the area near Nola in the east (on the right in the image) through the broad plain to enter the sea at a point between Lago Patria and the mouth of the Volturno river. There are an additional 210 km (130 miles) of secondary canals along the path of the main canal, producing an image of a naked fish vertebra with spines running off of it. In spite of the degraded state of the system (the most generous description I have found calls it "an open sewer") and lack of maintenance, the system still plays an important role in the maintenance of the hydrological regime of the basin. The entire area is intensely farmed and, as well, supports much small industry. The canal system goes back to the 1610, when the Spanish rulers of Naples decided to solve the flooding of the Clanio river and drainage basin once and for all. (They had actually undertaken earlier water management projects in area as early as 1539. Stabilizing the zone was high on viceroy Toledo's list of things that had to be done in order to turn Naples into the best fortified city in the Spanish empire.) For 1600—and even today it would be ambitious—it was a massive land reclamation and water management project and essentially amounted to straightening large sections of the river and converting it to a canal with added rectilinear secondary waterways. It took six years and involved the talents of the finest engineers of the day. (These included Tommaso Alappio, D.A. Cafaro, and Michelangelo Cartaro, all involved in their careers with such enterprises as the construction of the Royal Palace and the first university building in Naples, now the National Museum.) The finished product worked well and was maintained for at least three centuries. The Bourbon rulers of Naples expanded it in the 1700s; the area, after all, was on the way out to the new Royal Palace at Caserta and, thus, suitable for being "regally urbanized." (Some remnants of plush Bourbon villas can still be seen in the area.) The system seems to have survived usefully and relatively whole until the boom years after WWII. Overbuilding, unlicensed building, absolute disregard for the environment, etc. etc.—all that—so when it started to degrade, it went to hell in a very fast handbasket. A word about the Clanio river. It used to start in the hills above Nola, but today it no longer really exists. Whatever is left of the river apparently still flows underground near Lago Patria, feeding it and providing what little water movement and exchange exists in that body of water. Some sources claim that local farmers still dig down and tap that source for fresh water. In ancient times, the river actually flowed into the lake, but the canalization project moved the final stretch of the main river somewhat to the north. (The name lagni is probably a variation of Clanio. In Latin, the river was the Clanius, also Glanius; later, it was called the Lanius. Regi means "royal.") In any event, neither the old Clanio nor any other river actually feeds the Regi Lagni these days. Any new water that goes into the system is from rain run-off, which, however, can be considerable. Reclaiming the area means, first and foremost, going through the Sisyphean task of clearing out of the canals an unbelievable amount of rubbish, including junked cars, TVs and refrigerators—all that plus the chemical clean-up. But they are at work. Optimistic drawing-board visions see kilometers of tree-lined canals running through recreational areas and archaeological parks. Fiengo, Giuseppe. (1988) I Regi Lagni e la bonifica della Campania Fexlix durante il viceregno spagnolo. Firenze 1988. Olschki (Biblioteca dell'Archivio storico italiano.) Florence.